A Savior has been born for us: Jesus Christ Our Lord! I would like to address you with the same announcement that 'the angel of the Lord' proclaimed to the shepherds: "Behold, I proclaim to you good news of great joy that will be for all the people. 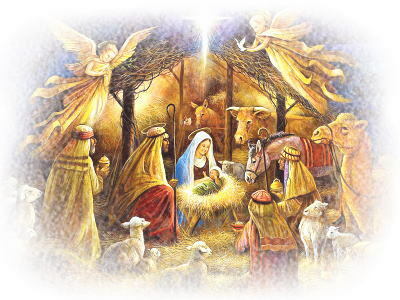 For today in the city of David a Savior has been born for you who is Messiah and Lord" (Lk 2:10-11). The term "Savior" has been mentioned before by the angel Gabriel sent from God to the Virgin Mary. He told her: "Behold, you will conceive in your womb and bear a son, and you shall name him Jesus" (Lk 1:31). The name Jesus means: God saves! Today, parents choose to give their children the name of a saint, or of a famous celebrity, etc. In the Bible the name of a person signifies the mission that that person will have in his life. For example, the angel appeared to Zechariah and told him: "Your wife Elizabeth will bear you a son, and you shall name him John… he will turn many of the children of Israel to the Lord their God" (Lk 1:13.16). This will be the mission of the son of Zechariah and Elizabeth, so his name will be John. The explanation of the mission "Jesus" is revealed by the angel of the Lord to Joseph: "She (the Virgin Mary) will bear a son and you are to name him Jesus, because he will save his people from their sins" (Mt 1:21). Hence, this is the mission of Jesus: to liberate humanity from their sins. In fact, through his death and resurrection, Jesus will once again open the door of heaven to all those who have been faithful to God in their life. John invited the people to repentance but still they remained in their sin, only Jesus can wipe away sins, since He is the Savior! Not anyone else! However, Jesus is the Savior not only because He forgives our sins but also because He wanted, through His Incarnation, to become one of us, to be near us, to accompany us in our life, to suffer with us, to share our joys and anxieties, to tell us that we are not alone in this world, that He, His Father and their Love (the Holy Spirit) are always with us, in us. If we overcome many trials in our life, it is not due just to our qualities and personal success but because Jesus is with us, intervenes and saves us. I have already received many e-mails from people wishing me Merry Christmas and Happy New Year. I respond to everybody personally, especially to those who wrote to me about their problems. What I found very important is that some people in spite of their sad situation (an old person sees his life at the end, a young lady is at a critical stage of a cancer, etc. ), they wrote: everything is a grace from God! Let us notice that Jesus did not heal that lady from her cancer but He gave her the strength to say that her cancer also is a grace from God! This is the work of Jesus, the only Savior! No one in the world can give this great consolation to a cancer patient, but Jesus could and did! He is THE SAVIOR! My prayer for you this Christmas is to experience a renewed friendship with Jesus; above all to experience that Jesus is really our only Savior. May the Lord grant you all a Holy Christmas and a Blessed New Year!